I’ve retaken possession of my DJR badged ‘Dave Russell’ which has been kept in my parents garage for the last 20years. Short of needing a good service and the replacement of a few perished parts, the dry storage has kept it quite healthy. However I have a niggling feeling about it’s authenticity, and wondered if there is a register of Dave Russell frame serial numbers, or if the sequencing/ length of numbers is in keeping with known genuine examples. The serial number is 48788, and here’s a shot of the bike straight out of storage. Looking at the bike in this thread - viewtopic.php?f=12&t=390717 - which has the same transfers as yours I would say that it is also a 'Twyford' Dave Russell. According to the entry on Classic Lightweights, Dave used the customers' initials as part of the number but neither of mine do. Mind you, one was built for Harrogate Show but the other was built for me - but neither was built by Dave himself. Dave's son was involved with the after effects of Dave's passing but whether or not there was a frame number listing I've no idea. Where did you get yours from? I'm assuming that, as you're asking this question, you didn't buy it new from Dave? It should clean up OK - and well worth doing I reckon. Thanks Old Ned, the bike in the thread link you have provided could almost be a sister bike to mine! As I recall, mine came from the Twyford shop - though carries a Slough reference on the diamond shaped head tube decal (not the swan logo). The components are of similar age i.e. very late 80's, early 90's, and I have evidence of the bike in use in '92/'93. My doubts on authenticity arise because neither I or my brother can remember buying the bike new, and we were going through quite a few back then. 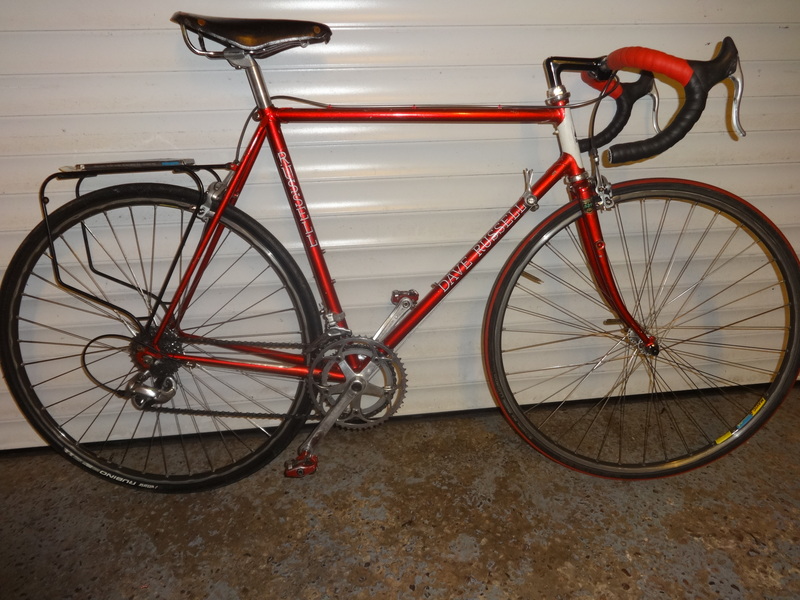 Also, we had a frame repaired by Dave and resprayed and we can't recall if that was this one or another (since sold on). The fact that this frame doesn't carry the typical custom build serial numbers of initials and 4 digits, but strikes a considerable resemblance to the bike in the other thread would lead me to believe it is one of his 'off the peg' builds. I used to hang about his shop a bit in the late 80s. My recollection is that "DJR" branding does indeed mean off the peg, and "Dave Russell" stickers means custom made, so that fits with your thoughts on the serial number.